Worldwide Covers | Nice covers from all over the world. In 2018 I received covers from 8 new countries/territiories that I was missing! A big THANK YOU to everybody, who helps getting my collection more complete! Nevertheless I am missing covers from a lot of countries. If your country/territory is on the list below, please send me a cover! 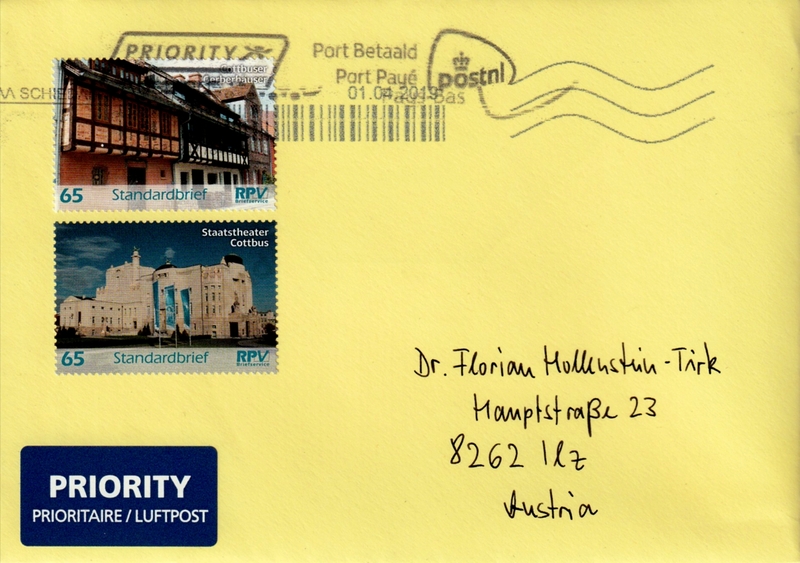 I am replying with a nice one from Austria. I am also interested in receiving letters from local and private post services. This very nice cover from Germany was sent by Ulf, thank you very much! It was posted in Cottbus on April 1 and delivered by the private post “RPV Briefservice” and PostNL. It arrived on April 8, 2019. The stamps are part of the set “Regionale Grüsse aus Cottbus” (regional greetings from C.), which was issued on September 28, 2018. The stamps depict the Gerberhäuser (Tanners’ Houses) and the Staatstheater. 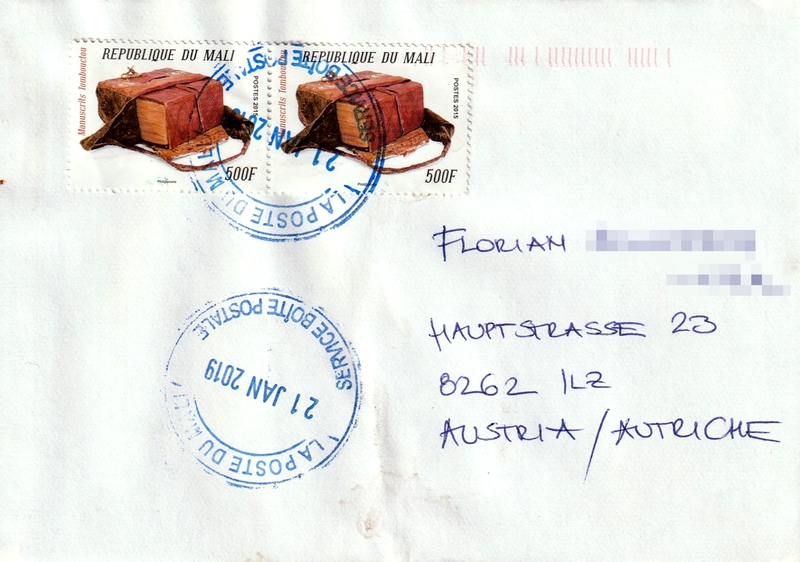 This very nice registered cover from Kosovo was sent by Cengiz, thank you very much! It was posted in Prizren on December 5 and arrived on December 18, 2018. The left stamp is part of the set “National Costumes”, which was issued on October 19, 2011. The next stamp commemorates the 100th anniversary of the Albanian alphabet. It was issued on November 14, 2008. 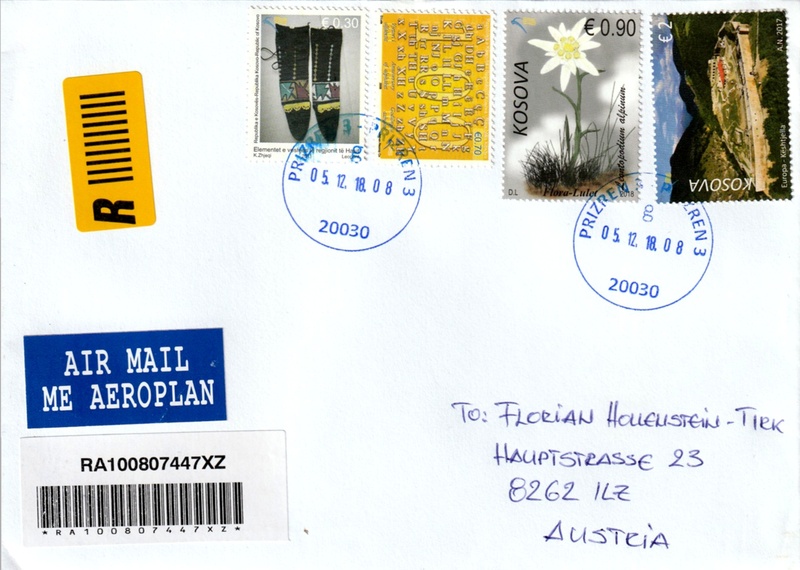 The next stamp commemorates the edelweiss (Leontopodium alpinum). It is part of the flowers set, which was issued on August 24, 2018. The right stamp was issued on May 9, 2017. It is part of a set of three stamps, and depicts the castle of Ulpiana. 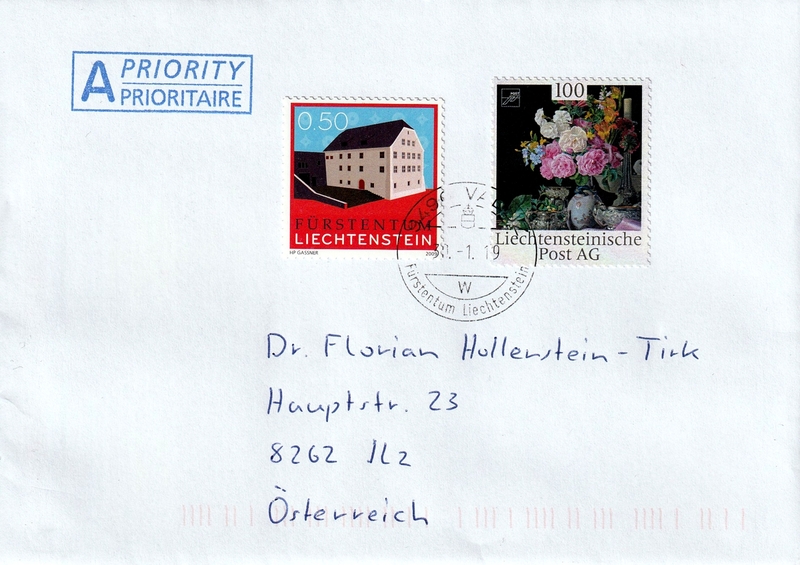 Here is another nice cover from Liechtenstein, thank you Vural! 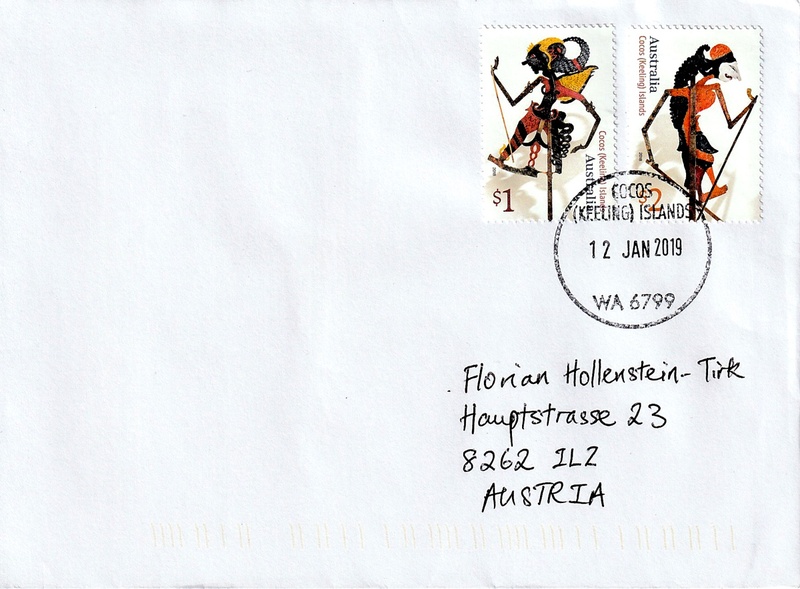 It was posted in Vaduz on January 30 and arrived on February 1, 2019. 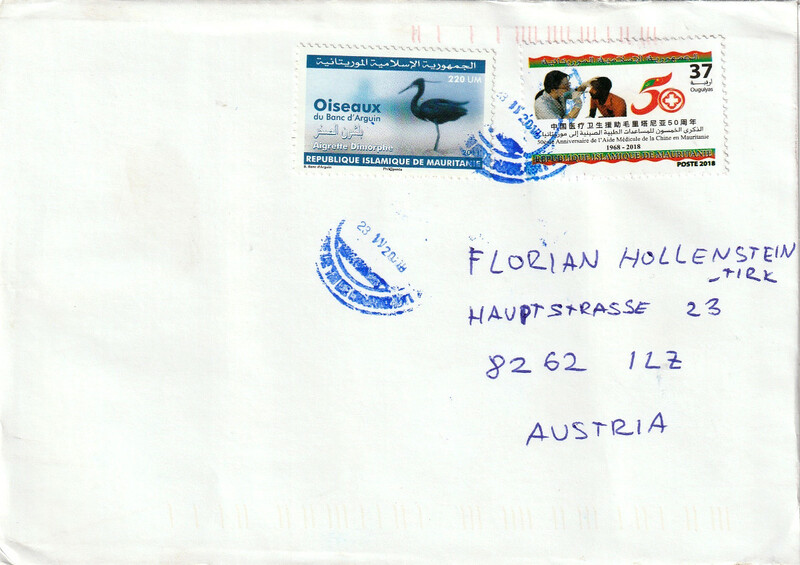 My first cover from Djibouti was arranged by Alena, thank you! It was posted on March 13 and arrived on March 22, 2019. 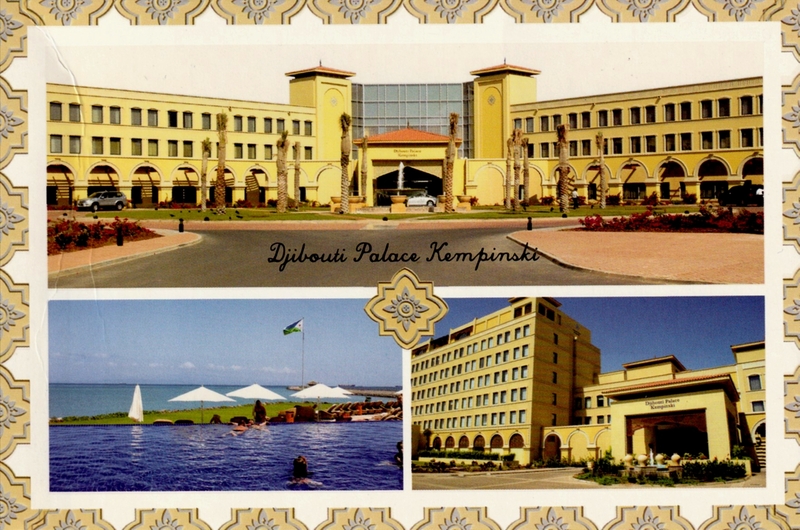 The left stamp commemorates the 100th anniversary of Djibouti’s Chamber of Commerce. It was issued on November 7, 2008. The middle stamp depicts a blacksmith. The stamp was issued on May 14, 2000. The right stamp was issued on August 8, 2005. It commemorates the 2006 FIFA World Cup. 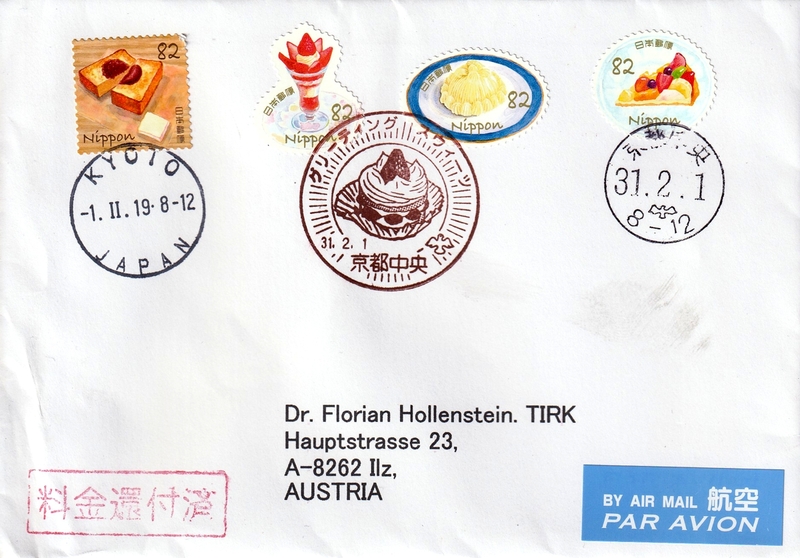 Thank you, Takeo, for sending this nice first day cover from Japan! It was posted in Kyoto (京都) on February 1 and arrived on February 7, 2019. 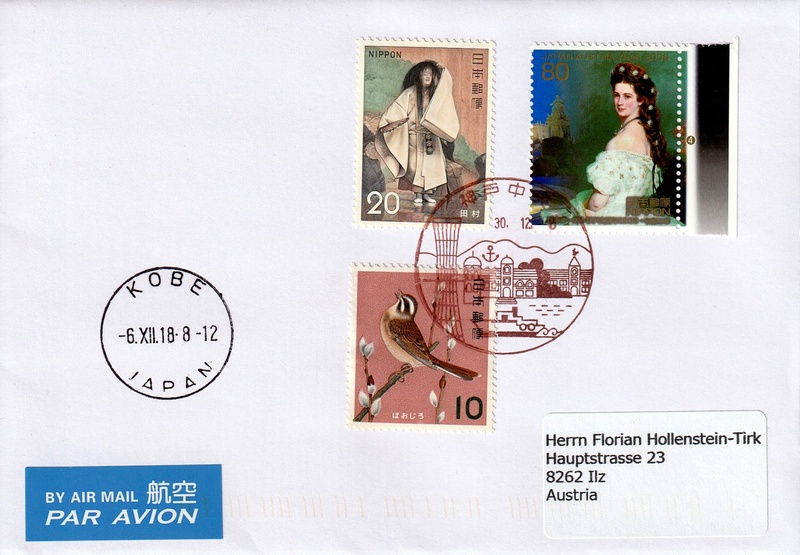 This nice cover from Japan was sent by Hiroshi, thank you! It was posted in Kobe (神戸) on December 6 and arrived on December 17, 2018. The right stamp commemorates Elisabeth of Austria</span) (1837 – 1898). 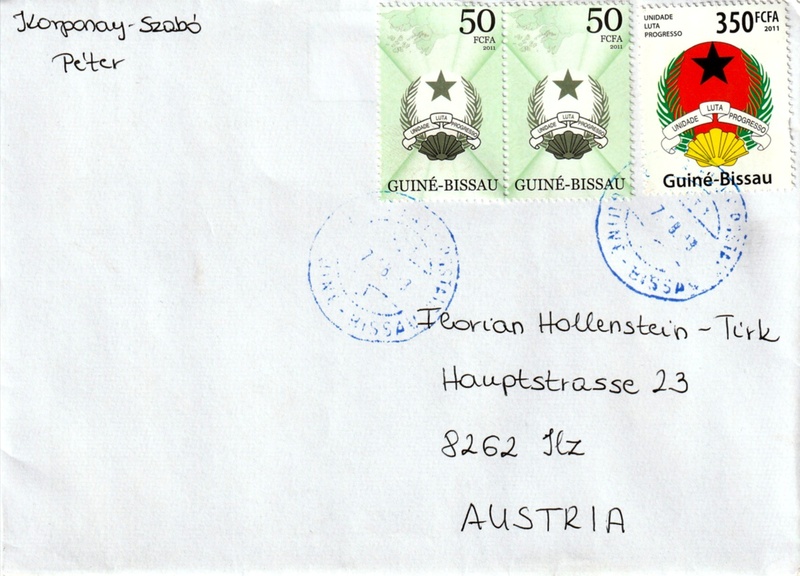 Tristan has sent this very nice cover from Brunei, thank you very much! It was posted on August 11, 2018. The left stamp commemorates the 30th anniversary of the National Day, the next three stamps commemorate the “Golden Jubilee of Royal Brunei Armed Forces” in 2011. 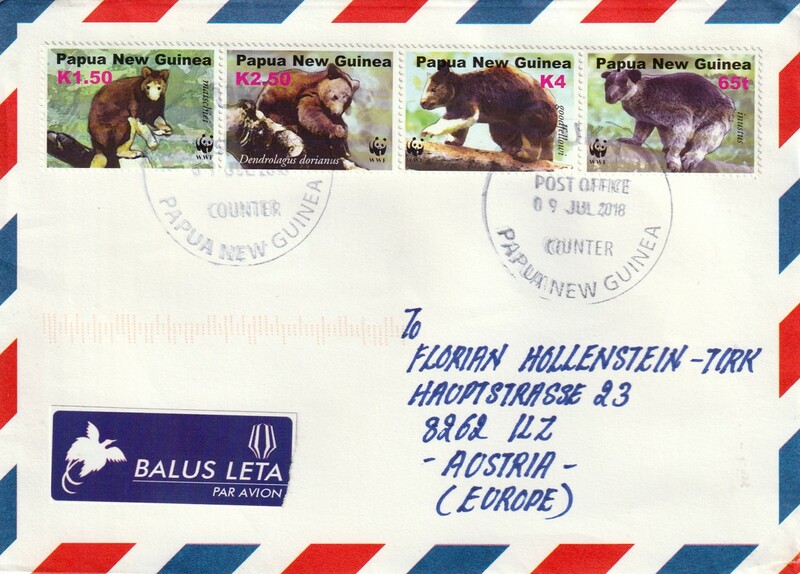 This nice cover from the Cocos Islands was sent by Austin, thank you! It was posted on January 12 and arrived on January 25, 2019. Jinesh has sent this very nice cover from Papua New Guinea’s autonomous region Bougainville, thank you! It was posted in Buka on July 9 and arrived on August 17, 2018. The stamp set depicts some tree-kangaroos (species of the Dendrolagus genus). Alena has arranged this very nice cover from Mali, thank you! It was posted on January 21 and arrived on February 11, 2019. The 2015 stamps commemorate the Timbuktu Manuscripts. 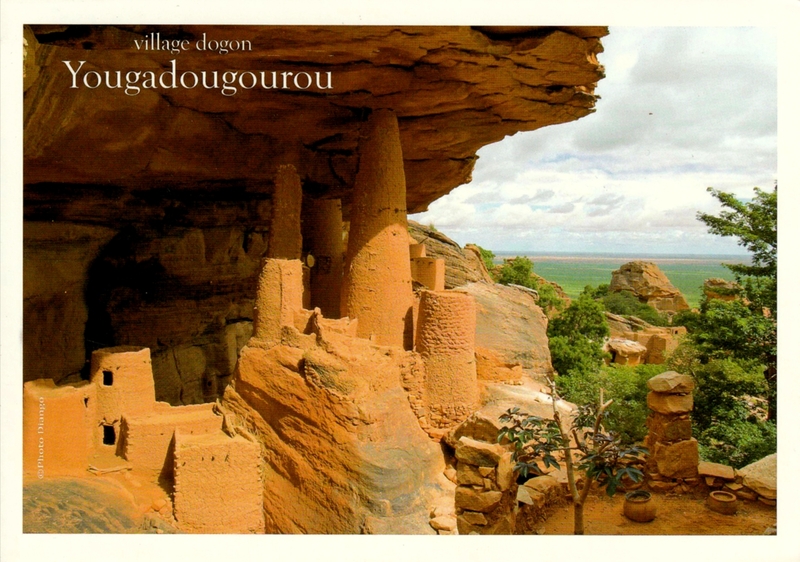 Inside the letter a card has been included, which depicts the Dogon village Yougadougourou. 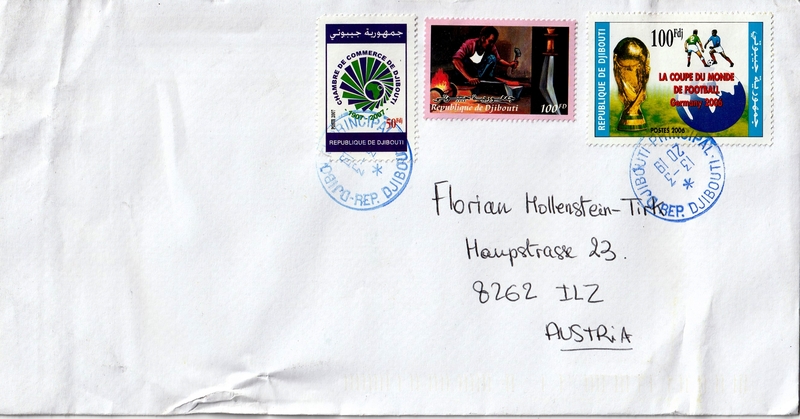 This very nice cover from Australia was sent by Alfred, thank you! It was posted in Fairfield Heights on October 24 and arrived on October 30, 2018. Alfred attached some stamps of the Australian Antarctic Territory. The top left stamp commemorates the Antarctic Treaty System. The top right stamp depicts some emperor penguins (Aptenodytes forsteri). 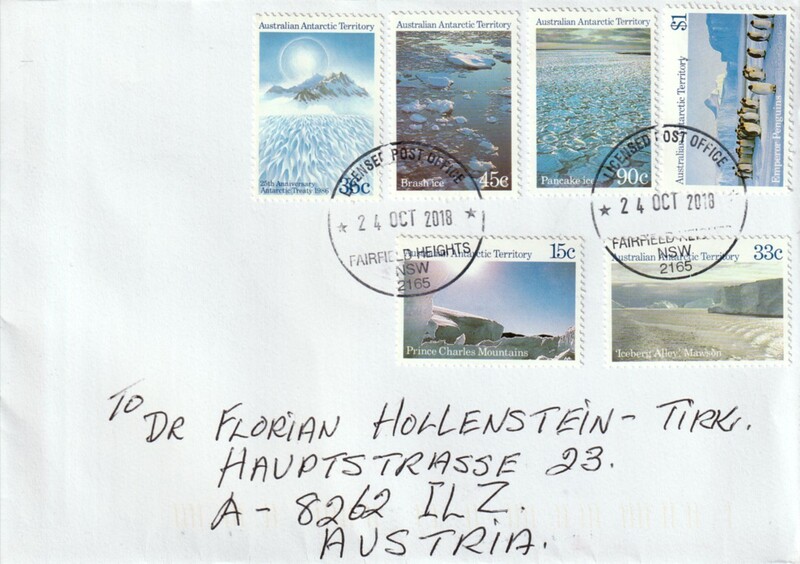 The bottom stamps depict the Prince Charles Mountains and an “Iceberg Alley” at Mawson Station. 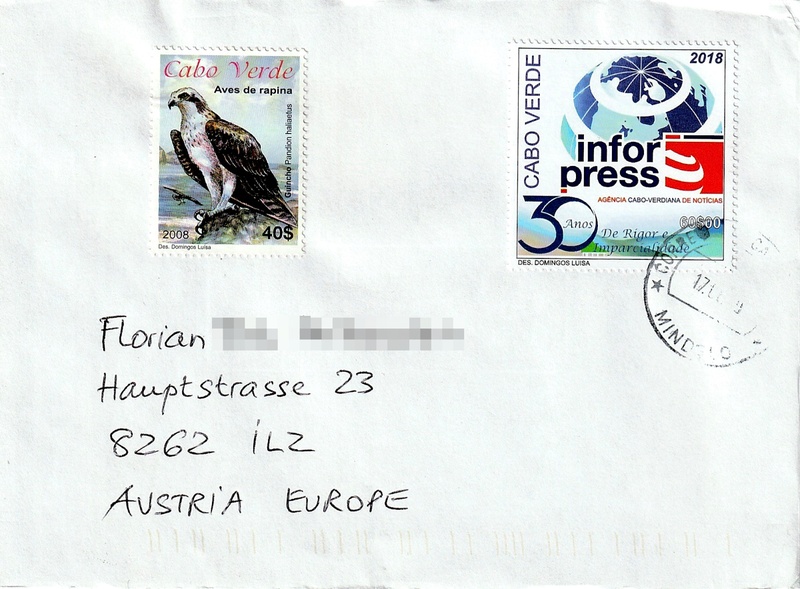 My first cover from Cape Verde was sent by Wolfgang, thank you very much! It was cancelled in Mindelo on January 17 and arrived on January 28, 2019. The left stamp is part of the “birds” set, which was issued on November 25, 2008. It depicts the western osprey (Pandion haliaetus). The right stamp commemorates the 30th anniversary of Inforpress, the Capeverdean News Agency. 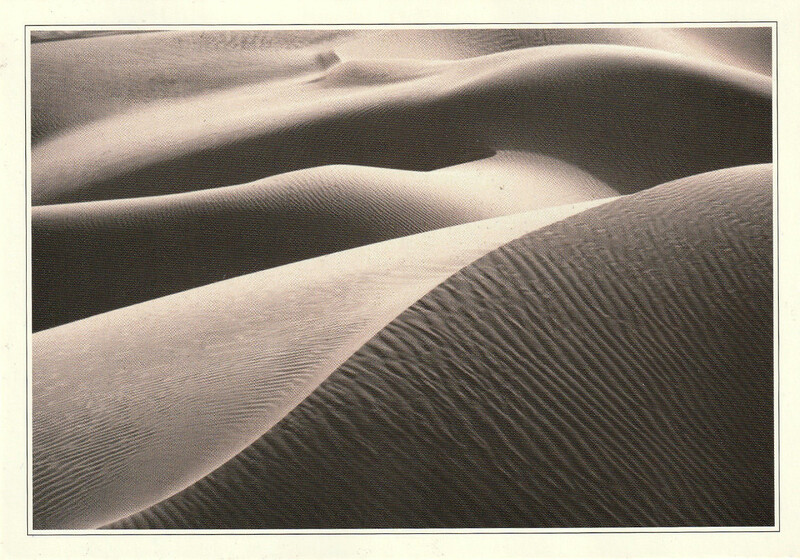 This very nice cover from Mauritania was sent by Alena, thank you! It was posted on November 23 and arrived on December 17, 2018. The left stamp is part of the set “Birds of the Banc d’Arguin National Park“, which was issued on October 24, 2011. It depicts the dimorphic egret (Egretta dimorpha). The right stamp commemorates the 50th anniversary of Chinese medical aid in Mauritania. This nice cover from Senegal was sent by Alena, thank you! 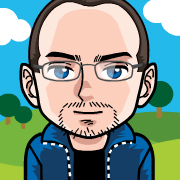 It was posted in Dakar-Peytavin on November 5 and arrived on November 21, 2018. The left stamp is part of the set “Cities of Senegal”, which was issued on December 7, 2017. It depicts the promenade in Thiessois. The right stamp is part of a set, which commemorates the 5th Gorée Diaspora Festival. It was issued on November 4, 2010. 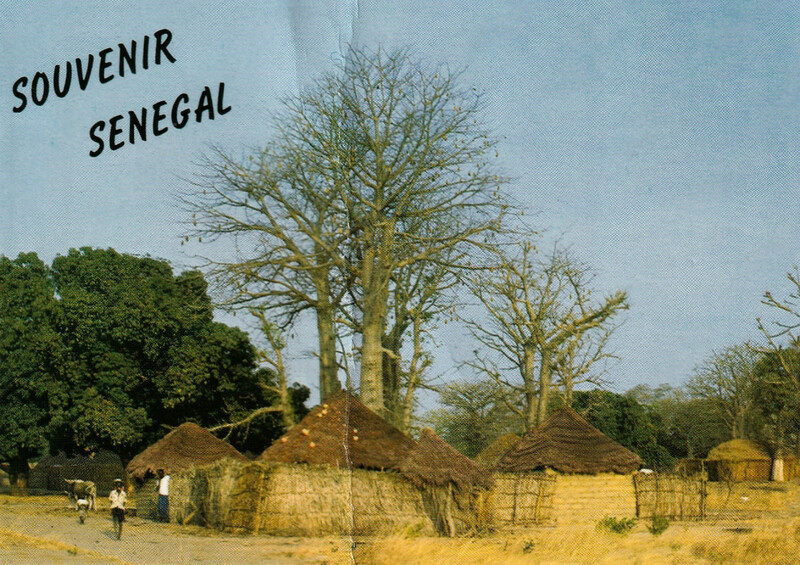 Péter has sent this amazing cover from Guinea-Bissau, thank you very much! It was posted on October 24, 2018 and arrived on January 8, 2019. The stamps are part of the set “Coat of Arms”, which was issued on July 28, 2011.